The Curriculum Framework for Romani (CFR) was developed by the Language Policy Unit of the Council of Europe as part of a comprehensive response by the Council of Europe to Roma and Traveller issues. The need for such support measures has been expressed in numerous international resolutions including Recommendation No R(2000)4 of the Committee of Ministers to member states on the education of Roma/Gypsy children in Europe, the Warsaw Declaration of Heads of State and Government of the member states of the Council of Europe (May 2005), the action plan attached to the Warsaw Declaration and the Committee of Ministers Recommendation CM/Rec(2009)4 on the education of Roma and Travellers in Europe. Moreover, the Secretary General has recently made a commitment to develop a Council of Europe thematic Action Plan on Roma issues. The (2011-13) QualiRom initiative, carried out under the European Commission’s Key Actions 2 programme, made extensive use of the Curriculum Framework for Romani (CFR) and two European Language Portfolio models. 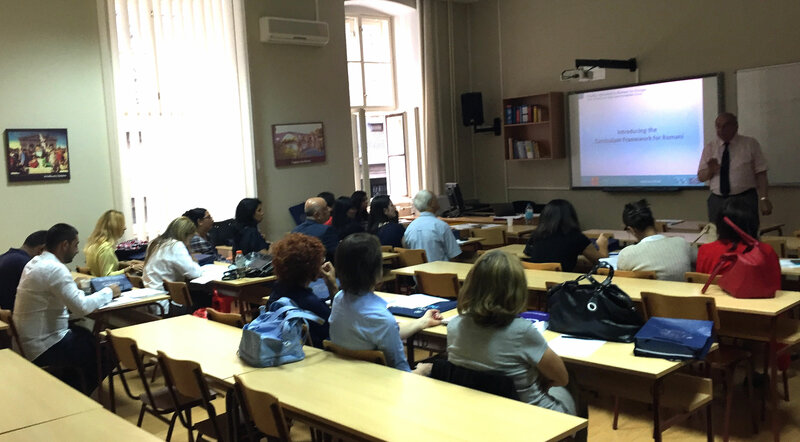 It focused on raising literacy levels in Romani and on training teachers of Romani. QualiRom set out to promote the inclusion of Romani in education systems and to contribute to the integration of speakers of the language by improving the educational situation of Roma children, raising the self-esteem of Romani speakers, contributing to the emancipation of people with a Roma background, and promoting equality of opportunity as a basic human right. The project has published an extensive databank of teaching and learning materials for teachers of Romani (http://qualirom.uni-graz.at). The materials developed in six Romani varieties range from proficiency levels A1 to B2 for learners at primary, secondary and tertiary levels and constitute the largest resource of its kind for the teaching and learning of the Romani language based on European standards. appropriate mediation arrangements when (some) participants do not have access to the working language. In partnership with the ECML, the National Education Institute in Slovenia and the Ministry for science, education and sport the QualiRom Training and consultancy event has been conducted in Slovenia for the second time. The seminar gathered participants involved in the education of Roma pupils with rather heterogenous backgrounds: pre-school and primary teachers, school directors, representatives of The National Education Institute in Slovenia, representatives of the Ministry for science, education and sport, researchers of the Educational Reasearch Centre, representatives of non-governmental organisations dealing with Roma education, representatives of the Center for School and Outdoor Education, representatives of the Office for National Minorities and a journalist of the Slovene National television. After a short introduction of the ECML Professor David Little and Jan Hero familiarized the participants with the Curriculum Framework for Romani (CFR) and both ELP for Romani language. Participants agreed that the CFR is an important systemic tool for increasing the quality of Romani language teaching in Slovenia. They also agreed that the use of the ELPs will be an important guideline on how to conduct lessons in Romani language and intercultural learning as well. Mr Jan Hero introduced the QualiRom teaching materials and shared the Slovakian experience in education of Roma pupils. The seminar offered the participants an opportunity to discuss about different challenges and obstacles they confront in the education of Roma pupils. The biggest challenge pointed out is the language barrier: many Roma pupils have a lack of language knowledge in both languages: Romani and Slovene. Entering school means for most Roma pupils that they need to learn two languages: Romani and Slovene. Teachers involved in education of Roma pupils feel overloaded by their own language barrier not knowing Romani. Thus they expressed the need for teaching materials, tools and guidelines for their work. The National Institute of Education in Slovenia will provide a learning plan for the Romani language and intercultural learning which will also lean on the CFR. Participants agreed that only an efficient knowledge of the first language is crucial for successful learning of additional languages. V Ljubljani je v organizaciji Zavoda RS za šolstvo in Ministrstva za izobraževanje, znanost in šport ter v sodelovanju z Evropskim centrom za moderne jezike v Gradcu potekal seminar »Ohranjanje in poučevanje romskega jezika v vzgoji in izobraževanju«, ki so se ga udeležili vodstveni in strokovni delavci v vrtcih in osnovnih in srednjih šolah, romski pomočniki, izvajalci v večnamenskih centrih, predstavniki (romskih) nevladnih organizacij, predstavniki ministrstva za izobraževanje, znanost in šport, raziskovalci Pedagoškega inštituta, svetovalci Zavoda RS za šolstvo ter druga zainteresirana javnost (novinarka televizijske oddaje za Rome So vakares, RTV Ljubljana). Udeležencem seminarja sta predstavila dejavnosti in delovanje ECML David Little in Ján Hero, ki sta povedala, da je glavna značilnost Evropskega centra za moderne jezike organizacija mednarodnih projektov na področju jezikovnega izobraževanja. V nadaljevanju sta udeležencem predstavila dokumente, ki so jih na ECML pripravili za poučevanje in učenje romskega jezika, ki jim bodo lahko v pomoč pri nadaljnjem delu z romskimi učenci. Udeleženci seminarja so izpostavili različne izzive ali težave, s katerimi se srečujejo tako na področju predšolske vzgoje kot ob vstopu romskih otrok v šolo. V prvi vrsti so izpostavili jezikovno bariero, saj romski otroci ne znajo dovolj dobro ne slovenskega ne romskega jezika. Pogostokrat se ob vstopu v šolo romski otroci začnejo učiti dva jezika, slovenskega in romskega. Prav tako vzgojitelji in učitelji ne znajo romskega jezika, ki ima poleg tega veliko dialektov. Vzgojitelji in učitelji so ob tem izrazili potrebo po pripomočkih, učnih gradivih, ki bi jim bili v pomoč v procesu vzgoje in poučevanja. Na Zavodu RS za šolstvo pripravljajo »usmerjevalni načrt« kot podporno gradivo učiteljem za poučevanje romskega jezika. Dobro znanje materinščine je namreč pogoj za dobro razumevanje slovenščine. "Quality education in Romani for Europe" - ECML training and consultancy offers for 2019: apply until 4 November 2018! To promote quality education in Romani within a human rights perspective by providing training on the use of QualiRom materials and consultancy on the Curriculum Framework for Romani for curriculum development (CFR). consultancy and training based on the QualiRom teacher training module. Detailed information on this offer and the 2019 request form are available on the dedicated web page. Slovakia participated in the development of the QualiRom materials (2010–2013), and for several years a small number of Slovak schools have been using the Curriculum Framework for Romani (CFR), the accompanying European Language Portfolios (ELP) and the QualiRom materials. Currently five schools are piloting a framework programme developed by the State Pedagogical Institute on the basis of the CFR, and the teachers are using the ELPs to promote reflective learning on the basis of learner self-assessment. The QualiRom workshop in April was designed to bring these practitioners together and discuss their experience in the light of Council of Europe principles and a reconsideration of the CFR and ELPs. The ECML training and consultancy workshop fulfilled its mission for all participants: language teachers at primary and secondary schools, their directors, textbook authors, representatives of the National Curricular Institution and of two universities that carry out activities in cooperation with the Ministry of Education to offer students programmes aimed at preparing Roma teachers in combination with other school subjects. Participants agreed that the Curriculum Framework for Romani (CFR) is an important systemic tool for increasing the quality of Romani language teaching in Slovakia and so far compensates the lack of a language institution for the development of the Roma language. Participants were inspired to create an Association of Romani teachers and by the end of the workshop had formulated the mission of this emerging platform. On the basis of the CFR the State Pedagogical Institute will develop annual plans for teachers teaching Romani language at primary schools and secondary schools for different language levels and pupil age. Participants expressed the need for a follow-up meeting with the ECML experts for consultation during the process of creating the aforementioned pedagogical documents. It was essential to have such a heterogeneous group of participants from all levels so that the document presented by professors David Little and Jan Hero are used in the best possible way at all levels and fields of activity. The lecturers also presented the theoretical side of the document, the purpose and the multiple possibilities of its application, as well as the examples of good practice. Through the workshops, the lecturers tried to make each participant find the points in the document that is relevant to their work domain – from the descriptors that facilitate the development of curricula and testing to the specific teaching examples that can be directly applied in teaching and working with Roma children. Participants used this opportunity to present strengths and weaknesses of their own teaching practices and they showed satisfaction that they could receive good advice and suggestions for teaching, as well as the possibility to develop better cooperation with everyone involved in Roma education. The participants were also satisfied to receive numerous materials at the seminar, especially the document prepared by the team and translated into the Serbian language and two dialects of the Romani language. The Ad hoc Committee of Experts on Roma and Traveller Issues (CAHROM) meet at the European Centre for Modern Languages on 29-31 March. The thematic visit, involving representatives from 9 countries, focuses on the protection, preservation and teaching of languages spoken by Roma, Sinti and Yenish, including ways to handle the opposition of traditional communities to have their languages written and taught. The group will also address the usability of the existing policies and materials for the improvement of the situation of the languages spoken by Roma and Travellers and the future perspectives of their developments. At the meeting, the ECML's training and consultancy initiative "Quality education in Romani for Europe (QualiROM)" will be presented.